Sartre’s life could be split into two distinctive periods. The first from his birth in 1905 until 1945, dedicated almost religiously to words. Literature as a kind of priesthood. The second from 1945 onwards when he embraced the people’s cause well before it became the name of a newspaper in the Sixties. Words used as weapons. Often said, but sometimes slogans hit the nail on the head. Although WW2 was not really « his war », it nevertheless marked the start of a need to fight for the freedom to write for Sartre. For Liberty itself, the hub of all his philosophical, literary and aesthetic thought processes. And ethics too, as he and Simone de Beauvoir would invent a new kind of « relationship » as a couple. From that point on it was important to be involved, as all power had to be questioned. « One does not put Voltaire in prison! » declared De Gaulle who held Sartre in high regard. This is probably why Sartre was appointed director of a newspaper called « La Cause du Peuple » (The People’s Cause) in 1970. Launched in May 1968 by Roland Castro in defence of Maoist ideas, the newspaper was not only seized several times by Raymond Marcellin, Minister of the Interior in the Pompidou government, but the paper’s first two directors, Jean-Pierre Le Dantec and Michel Le Bris were incarcerated. One of the images taken by young photographer Bruno Barbey at the age of 29 (whose body of photographs are now part of our collective culture) show exactly the freedom of expression that Sartre, with Simone de Beauvoir by his side, are in the process of defending in a dynamic way (and joyfully too, it seems) as they distribute the paper in the streets of Paris (or perhaps this was taken after a press conference which took place at the paper’s secret printing press) at the risk of finding themselves packed off unceremoniously in a police van. In the foreground an anonymous hand clutches some copies of the « People’s Cause » an image that fills and seals the composition, giving it all its visual punch. Another contextual element deserves to be mentioned here: the fact that at the end of the Sixties and in the early Seventies, many activists who acted with violence and made incendiary statements found themselves in the slammer. They expressed their solidarity with common law prisoners, perhaps for the first time in history. At the end of this movement the « Prisons Information Group » was launched, with Michel Foucault as the main figurehead. (*5). 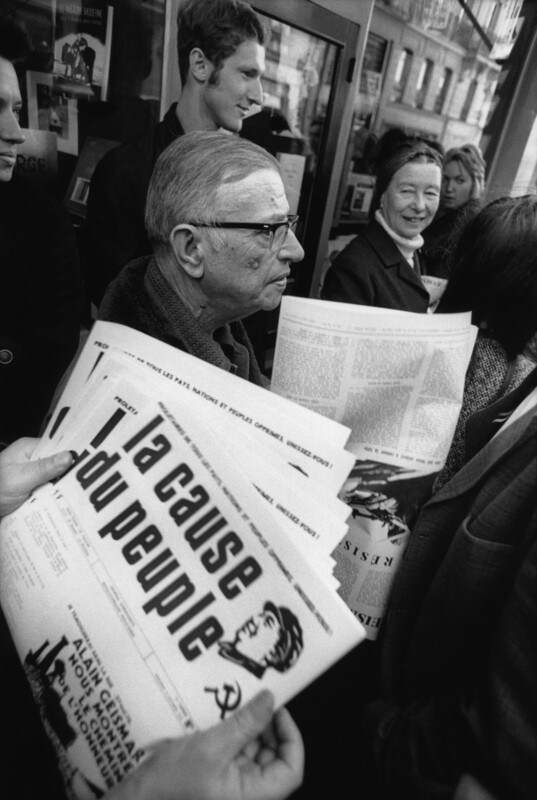 Sartre, defending « The People’s Cause » by Bruno Barbey really captures the fight for freedom of expression. But perhaps it is also a portrait of the era, of French society at the cusp of the Seventies and the various upheavals that it had endured up to that point. Nathalie Parienté, an art historian and freelance curator, lives in both Paris and Grenada. (* 1) : Annie Cohen-Solal, « Sartre, un penseur pour le « 21ème siècle », (Paris, Gallimard, 2000). (*2) : Annie Cohen-Solal, France Culture, 24th April 2017, « Jean-Paul Sartre. Vivre sa vie » : https://www.franceculture.fr/emissions/la-compagnie-des-auteurs/jean-paul-sartre-14-vivre-sa-vie (online). (*3) : « Le moment philosophique des années 60 », Introduction to the International Colloquium organised in 2008 by the Ecole Normale Supérieure and the International College of Philosophy: http://www.philosophie.ens.fr/Le-moment-philosophique-des-annees.html?lang=fr (online).